Atlantic Heights is a modern, newly refurbished townhouse, situated in a small private terrace with free parking, offering accommodation for the more discerning guests. As the address indicates, this guest house is situated on the seaward side of St. Ives, offering arguably the most magnificent views of the open Ocean, breathtaking coastal scenery and beyond. 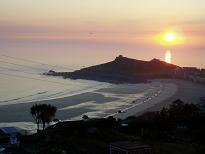 Due to its close proximity and open aspect, the view also affords uninterrupted views of the town, the Tate Gallery, the glorious Porthmeor beach, Godrevy lighthouse and the picturesque coast path to Zennor and beyond. Atlantic Heights is a non-smoking guest house and not suitable for very young children or pets. Standing in its own grounds, Dean Court occupies a commanding, elevated position on the seaward side of Trelyon Avenue. The panoramic views of St Ives Bay are breathtaking; from St Ives Town in the west, to Hayle Towans in the east and the prominent Godrevy Lighthouse, inspiration to Virginia Woolf. 'No1' is a bouchique style bed and breakfast in St Ives, Cornwall. Its aim is to offer you a relaxed and comfortable setting. No1 sleeps 8 in 4 bedrooms and was TripAdvisor travellers choice winner in 2011, 2012, 2013 & 2014. All of the rooms are located on the first floor, two with sea views towards Godrevy lighthouse and beyond. As you head out of the front door let your eyes lead you towards the ocean as you are just a short walk from the town centre with its unique style of shops, galleries, bars, pubs and some fabulous restaurants offering award winning food in exceptional locations, and lets not forget superb Porthmeor, Porthminster, Porthgwidden and Harbour beaches. The owners have travelled to some great places, and stayed in accommodation from the not so desirable to 7 star. They believe they know what makes a stay memorable, and after talking about it for a long time the opportunity came along to open their own bed and breakfast... this is No1. Salt House Bed and Breakfast opened in the Autumn of 2009. The unique house is situated in a picturesque and peaceful area just a short walk along the leafy coastal footpath to St. Ives, with its stunning beaches, mazey old streets and fine restaurants. The renovated contemporary house has 2 individually designed seaward facing rooms, each with breathaking far-reaching views of St. Ives Bay and Godrevy Lighthouse from their private terraces. Expansive glass helps to blur the boundaries of indoors and outdoors - you can even lounge in the bath whilst looking out to sea! The rooms are furnished to the highest standard with all mod-cons, they are light and spacious whilst being warm, we;lcoming and relaxing. Breakfast is chosen from a menu and delivered to your room or, weather permitting, your terrace. Salt House has gained a 5-Star rating and Gold Award from Visit Britain. Enjoy Salt House: Bed and Breakfast... but with Style! Sea Breeze is a luxury B&B offering a high standard of accommodation in the relaxed atmosphere of the owners home. Sea Breeze stands overlooking St. Ives and the Atlantic Ocean enjoying magnificent far reaching country and coastal views. Surrounded by countryside and minutes from the town centre, harbour and fantastic beaches. Sea Breeze offers the best of all choices, set in its own lovely gardens you have the opportunity to relax and enjoy the peace and tranquility or to take in the atmosphere of St. Ives with its quaint cobbled streets, Galleries, Restaurants, Pubs and interesting shops. Seaforth has amazing sea views and is less than 1 minutes walk from the seafront with restaurants,bars and beaches all close by. Train and bus stations are 2-3mins walk away. We have free entrance for our guests to the Tate St Ives and The Barbara Hepworth Museum. Free parking on request. Ten Ocean View is a privately-run, luxurious, quality guest house beautifully located with breathtaking views over St Ives Bay. Completely refurbished and refurnished, you will find Ten Ocean View offers exceptional quality. At Ten Ocean View you are assured of a warm welcome, the best cuisine and a very comfortable room. This is how a holiday should be!